Elevation Profile of Inca Trail Classic 30K course. 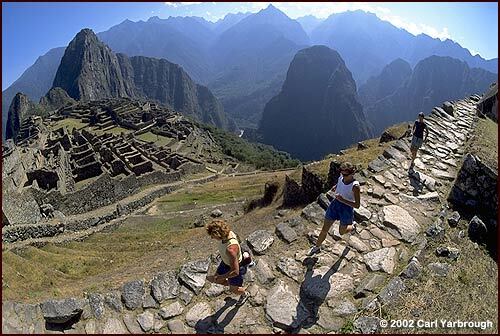 The 26.2 mile Inca Trail Marathon is also run on this course, with mileage added. Here is the Elevation Profile of the Inca Trail Marathon course. Land cost $3,400 including ground transportation in Perú; quality hotels, all meals and guided tours. If you are looking for a marathon in South America, join us to run the most spectacular South America marathon - the Inca Trail Marathon. With over 10,000' of elevation gain, two high passes (13,000' & 13,800'), and thousands of Inca steps we believe the Andes Adventures Inca Trail Marathon is the most difficult fully supported, regularly scheduled marathon in the world. We organized our first Inca Trail Marathon in 1996. Benefit from our 24 years of Inca Trail experience. Thousands of runners and trekkers from around the world have successfully completed our Inca Trail events and 100% of the marathon participants have completed the Inca Trail Marathon 26.2 and the Classic 30K course in one day. Please note, there is no "official" Inca Trail Marathon. There cannot be because the Inca Trail is in a National Park. Because it is in a National Park we feel the event should be low key. We run without bib numbers and limit the number of participants. Elevation Profile of Inca Trail Classic 30K course. Elevation Profile of the Inca Trail Marathon Course. Comparison of the Inca Trail Marathon to the Pikes Peak Marathon course. Our level of service is unparalleled. We won't leave you out on the trail wondering which way to turn! Our Inca Trail Marathon running adventure begins in Cusco, the archaeological capital of the Americas, at an altitude of 11,150 feet. In Cusco you will be able to see massive walls, cobblestone streets and remnants of the Inca empire and the Spanish colonial period. After a fascinating tour of Cusco, we are ready to start our running adventure, which offers a spectacular variety of trails in the Southern Peruvian Andes. We begin the Inca Trail Marathon on the ancient Inca trail that leads to the legendary lost city of Machu Picchu - an extraordinary adventure into the history of the grand Inca civilization. Along the way, we explore the intriguing ruins of Inca fortresses, and enjoy the expansive views from the high passes. Descending to the Sun Gate and Machu Picchu, the cloud forest trail becomes increasingly lush and varied. After two days exploring Machu Picchu  one of the world's most spectacular ruins  we take a train ride back to Cusco. (Please see the History of the Andes Adventures Inca Trail Marathon in our FAQ. • Run the Inca Trail – an unforgettable outdoor and cultural adventure! 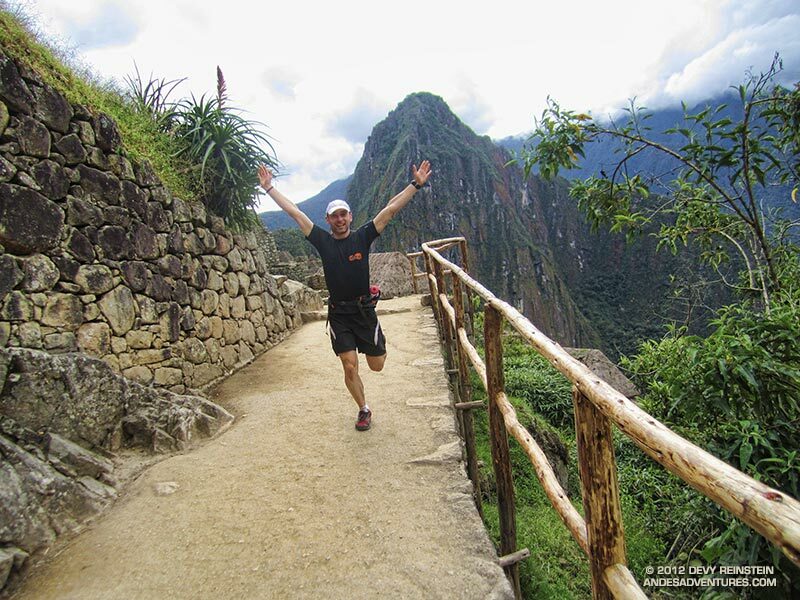 Run the Inca Trail Classic 30K course or 26.2 Mile Inca Trail Marathon option. Same start. Same finish. Fully-stocked aid stations and trail support. • Explore ancient archaeological sites of Cusco and the Sacred Valley. • Enjoy exploring the wonders of Machu Picchu. 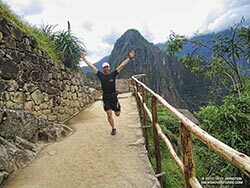 The Inca Trail Marathon to Machu Picchu follows the original pilgrimage trail that leads into the religious capital of the Inca Empire, the legendary “Lost city of the Incas” - Machu Picchu! The run is moderate to strenuous over mountain terrain at altitudes ranging from 8,000’ to 13,779’. You will see archaeological sites only seen by those that complete the entire Inca trail. On the Inca Trail, you will sleep in a comfortable campground, and porters carry the gear. • Andes Adventures Marathons in South America.